A favourite painting. Time and again, one searches the internet for a digital rendering of it. No success. Oh, give it another try, methinks, inspired by Mr. p3k’s mention of a modern performer with significant name resemblance. 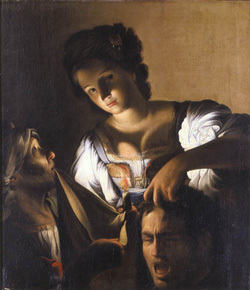 Carlo Saraceni’s painting “Judith mit dem Haupt des Holofernes”, painted around 1615 C.E., came into possesion of Mr. Leopold Wilhelm Habsburg in 1649. You can also see it on David Teniers the Younger’s painting “Erzherzog Leopold Wilhelm in seiner Galerie in Brüssel” (around 1651). Oh, and this page for some reason offers an enlarged vision, erm, version. As I know you, you won't be wearing it very long. They *do* have central heating here, you know.